Ultimate Beneficial Ownership (UBO) compliance is becoming more business critical for more industry sectors. The 5th Anti Money Laundering Directive (AMLD5) of May 2018 gives EU member states until January 2020 to implement new requirements into national law. The Directive builds on AMLD4, introduced to tighten financial loopholes and make regulations more watertight. These new directives are specifically aimed at ‘obliged entities’, namely financial institutions, law firms, accountancy firms, and credit agencies. With the net closing in on those who try to tax evade and launder money, criminal individuals and corporations are using ever more ingenious ways to get their money through the international banking system. For this reason, organisations on the new criminal hit-list are looking for new ways to comply with regulations without hurting their bottom-line, or the customer experience. This is a real challenge for mid tier banks and other regulated firms. But it also presents an opportunity. The chance to improve processes, minimise risk and embrace technology to speed up onboarding. With the stepping-up of criminal activity, ‘obliged entities’ are at risk of unwittingly helping to fund criminal activity and the reputational damage that comes with it. Furthermore, the financial penalties for not complying with AML regulations are becoming more severe. This is driving the need for better, faster, more accurate and streamlined Know Your Customer (KYC) processes. Estimates put the money laundering figure at around the £57 billion mark in the UK alone. An investigative report into high-end real estate purchases in Canada gives valuable insight into money-laundering activities. The ‘No Reason to Hide’ report reveals that 50% of high-value property purchase had no transparency regarding ownership. Holding companies (or unlikely nominees) owned the property, including students and homemakers. Further investigations traced many of the purchases to China and criminal gangs operating out of Guangdong province. The gangs were shipping various narcotics into Canada and were using high-end property purchases to ‘clean’ their money. Although many trust and shell companies are operating within law, their anonymity is attractive to criminals seeking to launder the proceeds of crime. The need for transparency on beneficial ownership was further highlighted by the release of the Panama Papers. Here, a list of corporations and wealthy individuals who were using offshore tax havens became public. Back then, the scale of tax avoidance came as a shock. This followed the leak of 11.5m documents to German newspaper Süddeutsche Zeitung who in turn shared them with the International Consortium of Investigative Journalists. Because some of the individuals identified were politicians (or connected to politicians), attention focused on the then British Prime Minister, David Cameron. It was revealed that his father had used Panama to offshore his earnings. In doing so, he kept his wealth out of the British economy. Arguably, the media attention was short lived but the outcry resulted in tighter laws around the identification and verification of UBOs. Now financial institutions, law firms, and accountancy businesses are being torn in two directions. On the one side, they’re being targeted by criminals wanting to use their services to launder dirty money. On the other, they’re under the microscope of regulators. Add to this the ever-watchful eye of the media and the case for compliance is complete. Trust in the finance industry fell through the floor following the crash of 2008. Financial institutions don’t need another blow to their reputation. For some, this could be catastrophic. To counter all these issues, institutions, lawyers, and accountants are performing more detailed checks on their potential clients. 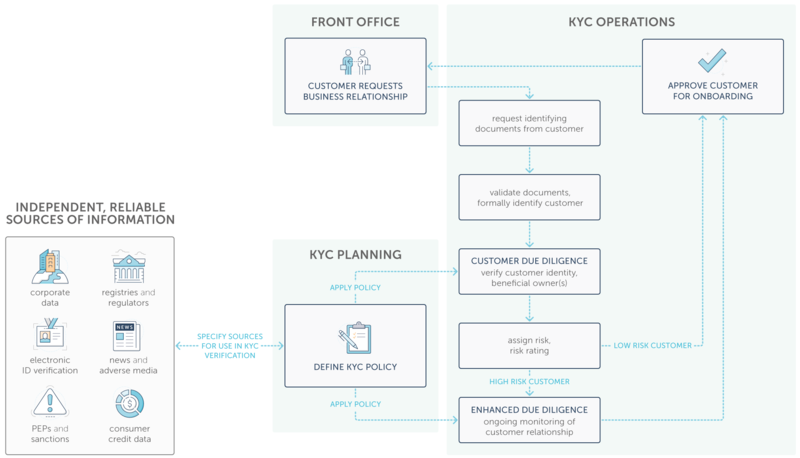 KYC processes screen out potentially high-risk clients. It is more important than ever that ‘obliged entities’ are not seen to deal with criminals — or earn a reputation for assisting tax evasion. The latest iteration of the EU anti-money laundering laws, AMLD5, brings in a number of changes that build on AMLD4 and incorporates suggestions made by the European Central Bank (ECB). Key changes tackle terrorism financing following a spate of attacks in Europe and close loopholes of previous directives. Specifically relating to UBOs, AMLD5 requires member states to make public the central beneficial ownership registers for legal entities the AMLD4 required them to create. The new directive also mandates improved interconnectedness of these repositories across the EU for enhanced information sharing. The need to collect accurate data to comply with new regulations requires you access more sources of data, including the aforementioned central registers, and to dig deeper to identify UBOs. The UBO identification process is traditionally slow as many corporate structures are either accidentally or deliberately complex, and the transparency of jurisdictions globally varies immensely. Without robust policies and technology in place, your profit and revenue streams suffer and client onboarding can grind to a halt. Weaker relationships with your customers are inevitable given the culture of ‘now’. The impact on targets and internal service level agreements are bound to be significant unless you can develop compliance processes that are accurate, fast and satisfy your good customers. This is where technology comes in. Getting a system in place that elevates accuracy without creating an onboarding bottleneck is crucial. A prospect may be identified as either a customer or a counterparty. Corporate ownership information will be obtained from the prospect in the form of a questionnaire. This will undergo evaluation and risk assessment. At this stage some prospects will receive approval immediately and continue the onboarding process. Others will be required to undergo further assessment and research. Transparency and access to ownership data varies by jurisdiction, often making ownership structures confusing and hard to map out, especially when dealing with companies operating in multiple countries. Once KYC data collection is complete it now requires evaluation. Accurate UBO information is critical at this stage, and other sources to identify adverse media and political exposure need to be factored in. Some prospects will be successfully onboarded, some rejected, and some prospects will undergo a further review stage before a final decision is made. In all cases, detailed and accurate records of the onboarding process need to be maintained and kept as a part of your auditable trail. To comply with regulations and UBO best practices customers must be continuously monitored against the necessary data sources for material changes that may affect their risk profile. Any changes must be investigated and remediated promptly. There are several challenges when identifying UBOs. What follows is a broad-brush of the difficulties faced by organisations like yours. One key challenge faced is how to determine which definition applies when identifying UBOs. The current EU AMLD4 lays out one definition that is not necessarily the same across other jurisdictions. Ownership threshold levels required for due diligence are also different, making the UBO issue more confusing. FinCEN’s Customer Due Diligence Rule and AML4D require UBO identification to a 25% threshold, whereas FATCA (Foreign Account Tax Compliance Act) requires a 10% threshold. Obtaining the big picture of a customer in UBO terms requires access to multiple data sources. As such, gathering all this data by hand is time consuming. Analysts spend hours on this aspect of the task alone, which greatly increases time pressures. Following this is an in-depth, often manual, analysis of the data to make a decision. Due to the time pressures analysts face to onboard customers quickly, human error occurs. Inaccuracies in the data analysis can expose you to significant risk, reputational damage and financial penalties. Customers expect a smooth, fast process when opening new accounts or accessing new products and services. Lengthy KYC onboarding times can result in losing customers and revenue. At the moment there is a significant lack of transparency as corporate structures can span the globe. Often, banks and investigators find deciphering ownership and accurately identifying UBOs impossible. Not all countries have online corporate registers or publicly provide information on company directors. Fewer still offer shareholder details. Add in out of date, inaccurate, or incomplete information and the UBO process becomes more complicated. The new AMLD5 regulations demanding the introduction of public centralised registers with easier data retrieval processes are a significant step in improving this situation. Increasingly automated technology is playing a critical role in identifying UBOs. For large scale and complex assessments, it is becoming increasingly impossible to achieve without it. The challenge for ‘obliged entities’ is to choose the right automation solution and to ensure it’s adopted across the organisation. This is more significant given the high failure rate the financial sector has seen when implementing new systems. Progress is inevitable and mankind’s ability to harness tools and technology has seen us make significant advances. As we move into the Fourth Industrial Revolution, with breakthroughs in artificial intelligence and the digitisation of processes, intelligent process automation is the technology that defines this time. This technology represents an opportunity to meet the increasing challenges of KYC and UBO in banking and other regulated sectors. Compliance can, and will, reap tangible benefits at a time when business has never been riskier. In order to take advantage, companies can redesign KYC processes where people and new technologies collaborate hand in hand. 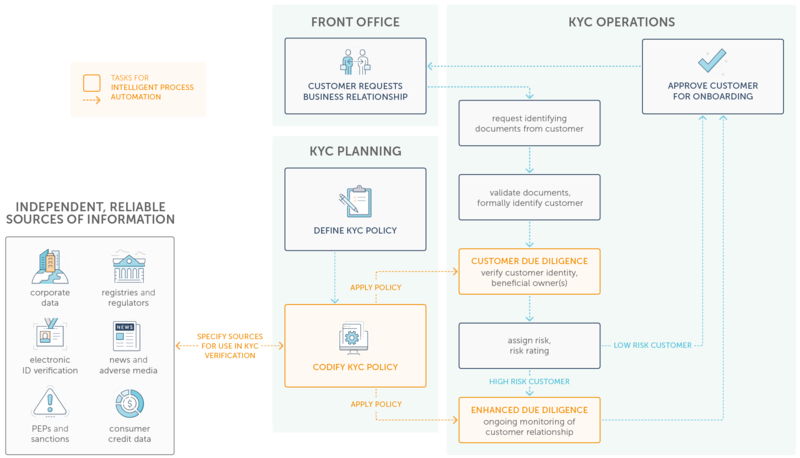 Codifying policies to programme a software robot automates the UBO identification process and ensures that the KYC policy is consistently applied for every new customer. Compliance experts can then step in when their judgment and problem-solving skills are needed to complete more valuable tasks such as tackling complex UBO investigations or advancing policies. encompass confirm harnesses process automation to retrieve, aggregate and analyse data in real time. See the technology in action here and embrace intelligent automation with confidence. For further insight on the importance of ultimate beneficial ownership identification, download our white paper from encompass co-founder and CEO Wayne Johnson: Exploring ultimate beneficial ownership and the role it plays in laundering illicit funds.